Apparently Bainbridge middle school students really know how to write essays. Last week Woodward Middle School student Julia Batson won the state Letters About Literature contest and moved on to the national competition. This week the school district received word that Odyssey seventh grader Michaela Leung is a champion of the NASA Titan & Europa Essay contest. The contest challenged students choose the goal for the next NASA outer solar system mission. Students could pick between Saturn’s moon, Titan, or Jupiter’s moon, Europa as the target for the mission. They were asked to defend their choice based on its scientific value. The winning essays will be posted shortly. Winning classes will be invited to take part in a teleconference with NASA scientists. Judges complemented Leung “articulate prose and sound scientific zeal” in their announcement of the award. 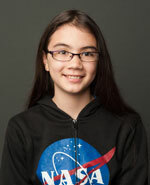 Leung won the Cassini Scientist for a Day Essay Contest in 2012. You can read that essay here. A Bainbridge Island middle school student is one of three champions of the state Letters About Literature competition. The competition, sponsored by the Washington State Library and the Library of Congress, encourages students to write letters to their favorite authors. About 3,400 letters were submitted. Woodward Middle School seventh grader Julia Batson won her age group with a letter to Randa Abdel-Fattah, author of “Ten Things I Hate About Me.” In her letter, Batson discussed how the book changed her thoughts on discrimination, friendship, and the struggle to find a place in a peer group. Batson’s winning letter will now be sent to the Library of Congress for the national competition. Winners will be announced in late April. The Bainbridge Island School District and Bainbridge Schools Foundation each responded this week to continued criticism of the Spanish Immersion Pilot Project at Commodore Options School. As we reported last month, some Bainbridge parents questioned the process used to create and fund the pilot (known as El Velero this year). Calls for greater transparency continued at a Feb. 28 world language forum, while other parents spoke in support of the program. Instead of being open about their intentions and avoiding backlash, BISD created SI with a lack of communication, financial transparency, and due process. The school district and foundation should be held accountable for these shortcomings and work to earn the public trust once more. The Bainbridge Island School District will hold a special meeting on Thursday to discuss eliminating one or two custodians, a half-time groundskeeper, a half-time bus dispatcher and a half-time assistant superintendent. High school security personnel and paraeducators may see hours reductions. The district may reduce administrator pay may by 2 percent, delay new curriculum, eliminate teacher stipends for clubs, close the district print shop and cut three daily bus runs down to two. Fee increases are proposed for sports, clubs and facility rentals. Districts across the state are also pondering layoffs and other cuts in reaction to a $9 billion state budget deficit. The BISD meeting is scheduled for 7 p.m. at Bainbridge High School. The Bainbridge Island School District is slated to receive $950,800 in a federal stimulus package that passed the House on Wednesday. The money is directed toward new construction projects, but leftover funds could be used for programs serving poor and disabled children. When Elvis walked on to the stage dressed head to toe in tight black leather, he did what any Elvis would do. He flashed a sideways smile and turned his back to give the full view. The old ladies blushed. The young girls screamed. Some things never change, even if Elvis does. It’s not Elvis she’s praising, it’s the close approximation she brought up from Puyallup to play a fundraiser at her son Ben’s school. Saturday night’s performance marked the third time Elvis performer Danny Vernon has shaken his hips to help raise money for The Island School. The show was also the first in the private school’s newly built gathering hall. Has ‘Paint Night’ gone too far? I’ve traced the ‘Paint Night’ tradition as far back as 1966 (thanks to Patti Ritchie). Can you trace it back farther? Fess up, old timers.